BHMA (Builders Hardware Manufacturers Association) is accredited by the American National Standards Institute (ANSI), a private non-profit organization that administers and coordinates the voluntary standardization to develop and maintain performance standards for builder's hardware. 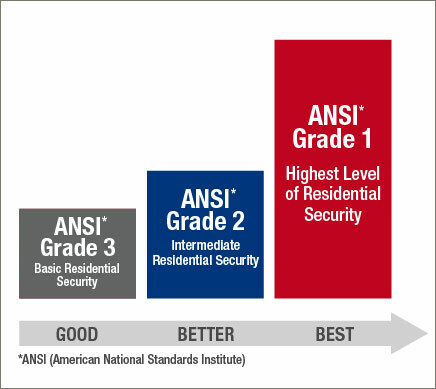 ANSI/BHMA standards set forth different product grades for door hardware products. These product grades are defined by progressive levels of performance benchmarks in each applicable standard. The purpose of each is to help identify the quality and durability of locksets through a series of operational and security tests.